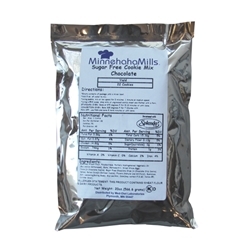 Make cookies an every day option using Minnehaha Mills® Sugar Free Cookie Mix. These add-water-only sugar free treats are great as a dessert or afternoon or evening snack. Ingredients: Enriched And Bleached All-Purpose Flour (Wheat Flour, Niacin, Reduced Iron, Phiamine Mononitrate, Riboflavin, Folic Acid), Polydextrose, Shortening Powder (Palm Oil, Maltodextrin, Sodium, Caseinate (A Milk Derivative), Dipotassium Phosphate, Mono And Diglyceride, Sodium Hexametaphosphate, And Silicon Dioxide), Maltodextrin, Dried Whole Eggs, Fiber, Corn Oil, Non-Fat Milk Powder, Arabic Gum, Sea Salt (Salt, Magnesium Carbonate), Baking Powder (Sodium Acid Pyrophosphate, Sodium Bicarbonate, Corn Starch, Monocalcium Phosphate), Sodium Bicarbonate, Natural & Artificial Flavors (Dextrose, Corn Starch, Less Than 1% Turmeric, Less Than 1% Apo Carotenal, Alcohol, Food Starch Modified, Maltodextrin, Redefined Corn And/Or Soybean Oil, Natural Tocopherols As Antioxidant, Tricalcium Phosphate, Less Than 2% Silicon Dioxide Added To Prevent Caking, Alpha Tocopherol (Vit E USP, FCC) Used To Protect Freshness), Sucralose, Cocoa Powder. CONTAINS: MILK, SOY, WHEAT.